Have you heard of ZSweet? This is a sugar substitute made of erythritol, which is a sugar alcohol found in many fruits and fermented foods like soy sauce, cheese, and wine and other fruit extracts. It has zero calories and it definitely does not leave an aftertaste. Many of the sugar substitutes tend to leave an aftertaste, so I was pleasantly surprised that it did not. I also used it to bake with and you really would not know a sugar substitute was used, my banana bread and muffins were quite delicious. Oh, and it does not leave you bloated or gassy like many artificial sweeteners. Taken from the the website : We are dedicated to offering healthy and delicious sweeteners with all natural starting materials, ingredients, and all natural processing. 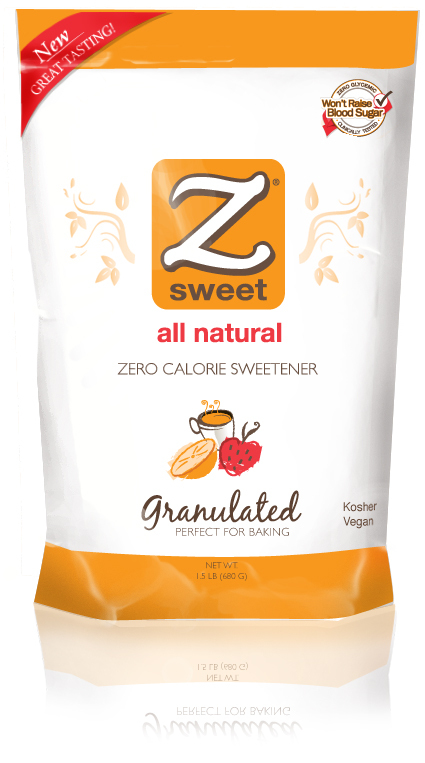 Therefore, all of the ingredients in ZSweet® are non-GMO, as well as gluten free and contain no known allergens. This product is also very good for Diabetics because it does not increase blood glucose levels. The website has a FAQ section as well as a recipe page and you can even down load a recipe book. Let me know if you try it. Have you used sugar substitutes in baked products before? Or do you prefer to use sugar?